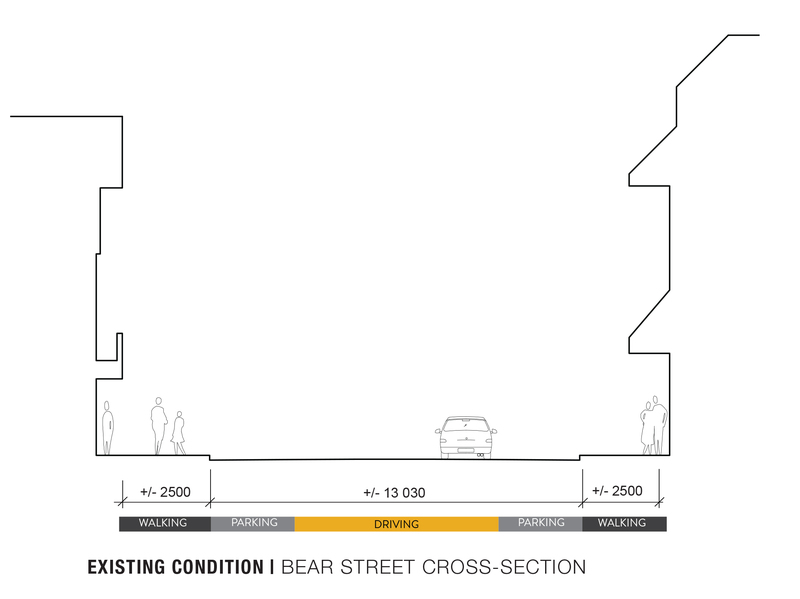 The Bear Street Shared Street (Woonerff) project helps pedestrians, cars and cyclists become equal users of the commercial road. Cars drive at a very slow speed, pedestrians have the right-of-way and cyclists travel through at a leisurely pace. Following four summers of trials with temporary features, the Town developed a proposed street redesign with construction in 202 to occur at the same time as renewal of underground drainage, sewer and water main systems. The Town held 13 hours of public input sessions in February and March 2019 to compile feedback on design options. On March 25, 2019, council was presented a What We Heard (PDF) report. Administration also provided options for the design in response to the feedback in a Council Report (PDF). Council is scheduled to discuss the options on April 23, 2019. Introduction of Banff Refreshing-style street furnishings (public benches; waste bins). 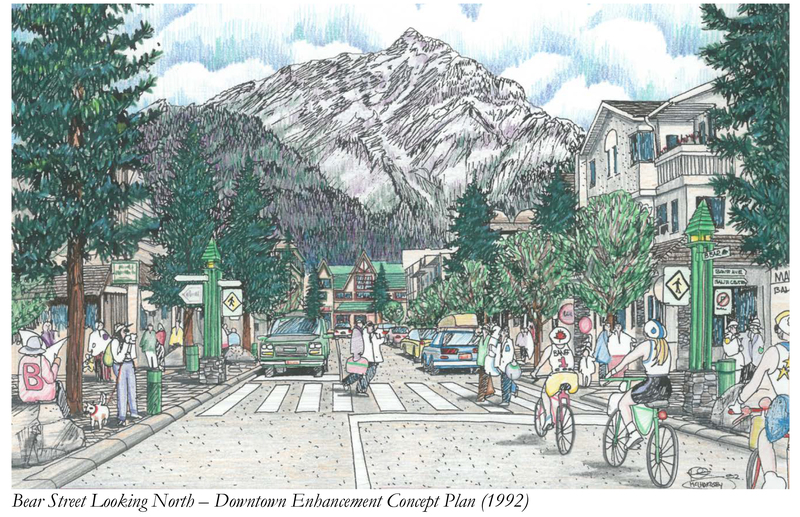 Banff Town Council will approve the final design plan, after considering safety, environmental, economic, social and engineering factors. 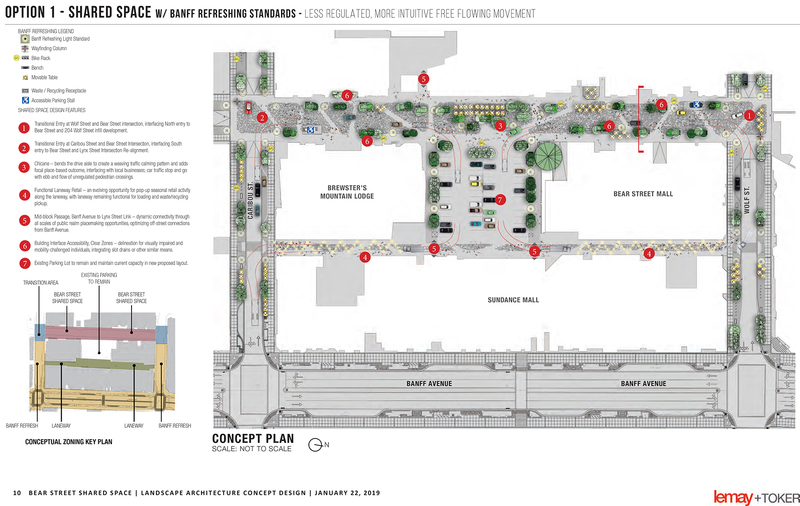 Turning the 200 Block of Bear Street into a shared street was one of the recommendations in the Transportation Master Plan. The Town has been testing the design and impact of the "Woonerff" to assist with long-term decision making. Woonerf is a Dutch word used to describe a shared street, or "living street." The concept is used throughout Europe and is gaining popularity in North America. Banff is a very walkable community, so it was a natural step for us. It was also an unusual word that helped it stand out and draw attention to this new project. The Dutch word is actually spelled Woonerf (with one 'f') but we used 'ff' to mirror the way we spell Banff! 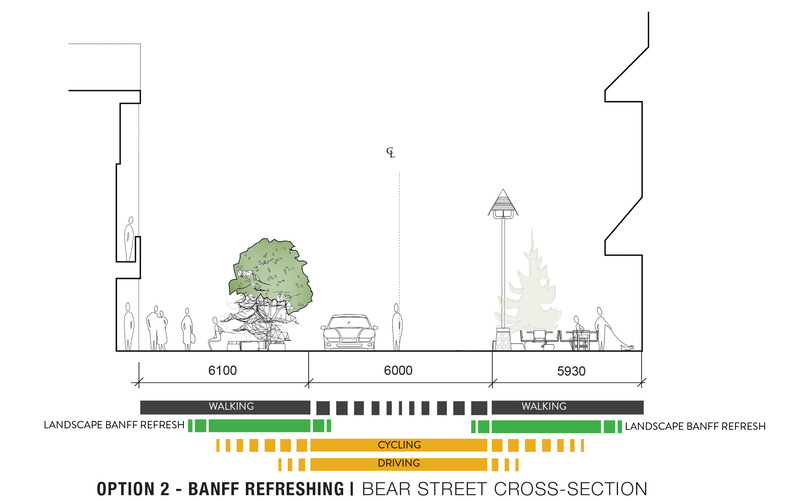 Bear Street is not considered a main arterial road in the downtown core and receives a fraction of the vehicle and pedestrian traffic of nearby Banff Avenue or Lynx Street. 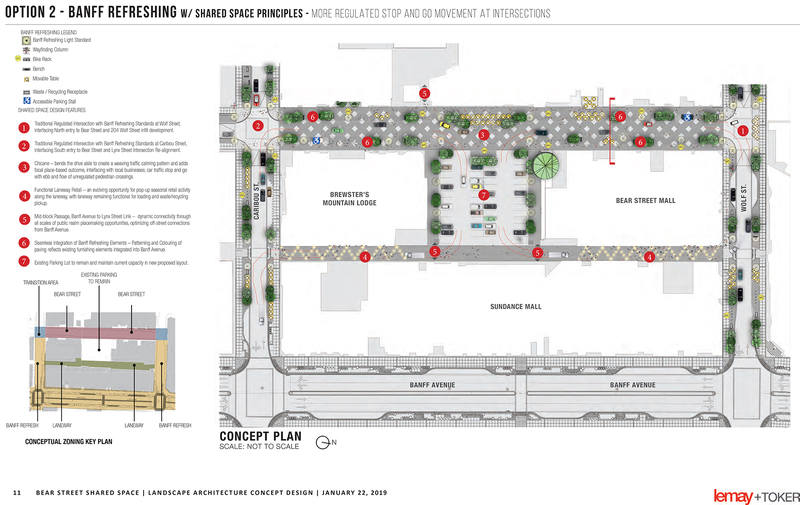 Living streets, or shared roads, are designed to foster more sustainable, active modes of transportation, and enhance the vibrancy of downtown spaces. Studies have shown that making streets more friendly to cyclists and pedestrians has a positive economic impact for businesses on the street. 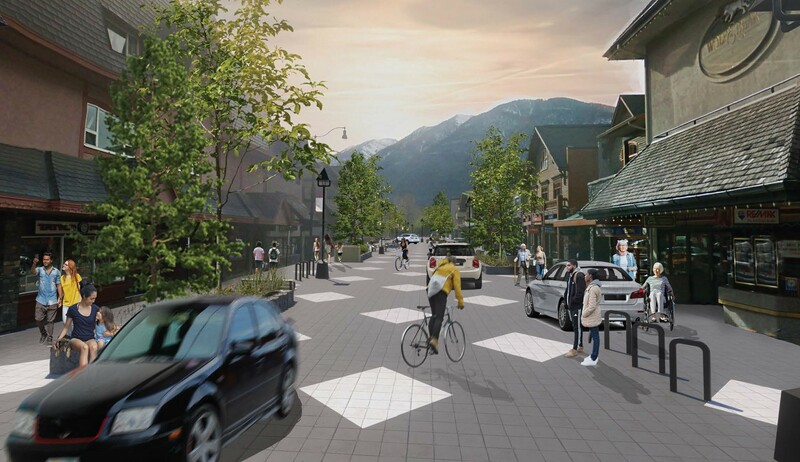 In addition, a more pedestrian-friendly road in our downtown provides an additional attraction for visitors to popular Banff Avenue in peak season. 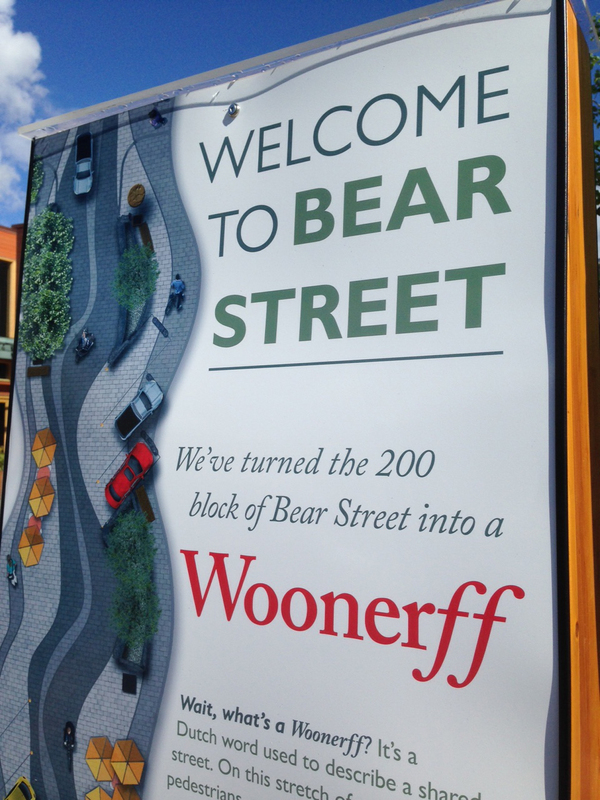 Summer 2018 was the fourth and final year of the Bear Street Woonerff trial. A trial was also held on adjacent Wolf and Caribou streets. After public consultation, final design work and planning of reconstruction of all underground services such as water, storm and sewer services, the construction of permanent features will start in spring 2020.